As expected, Sony has made a major move towards the commercialisation and (what it hopes to be) the imminent mass market acceptance of 3D TV in 2010 (and beyond) at this week's IFA event in Berlin. So, the message is "forget about HD, 3D HD is where it's at!" it would seem, according to Sony boss, Sir Howard Stringer. Sony is set to introduce a fully-3D capable Bravia LCD TV in 2010, with the aforementioned Chief Exec Howard Stringer singing the praises of what he clearly hopes to be the next major tech – following high-def - in the TV market. "Incorporating frame sequential display and active-shutter glass systems, Sony's proprietary high frame rate technology will enable the reproduction of full High Definition high-quality 3D images, and will form the centerpiece of Sony's 3D entertainment experience for the home," reads Sony's IFA release. In addition to 3D Bravias, Sony is also set to introduce and "develop 3D compatibility into many more of its devices, such as Blu-ray Disc products, Vaio and PlayStation 3, to provide a multitude of ways in which 3D content can be enjoyed in the home - from 3D movies to stereoscopic 3D games." "At IFA this week the big news is going to be 3D! Several companies will be showing their new 3DTVs, which is really exciting and having been privileged enough to have seen some of the prototypes, they really do produce exceptional results. 3DTV not only gives you the high resolution of HDTV, but also allows you to look into the worlds with a far greater level of immersion. 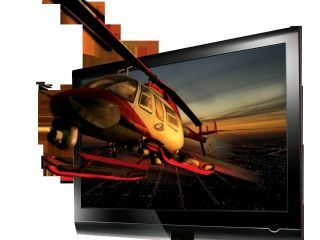 3DTV will soon be the new HDTV." Sony also launched a new branding strategy at IFA 2009 – with its "'make.believe' philosophy" signifying the company's ability to "turn ideas into reality", with lots of talk at the IFA conference of 'synergies' and 'leveraging resources' in order to help promote 3D in the home.